For your convenience, our most common customer questions for auto shipping are answered right here within our transport FAQs. Q: How do I ship my car? A: Whether you’re a returning customer or first-time shipper, we’re here to help you every step throughout the transport process for peace of mind and a stress-free shipping experience. The first step is to receive a free, no-obligation custom domestic quote and arrange your transport with one of our transport specialists. With one point of contact, your transport specialist will walk you through the steps of shipping. After you have a received your quote, the next step is to fill out our information sheet and sign our contract. Once we have your contract on file, we will touch base with you as soon as we have a carrier lined up for pick up and delivery to confirm dates before we process the work order. Our dispatch and routing office will call you to set up pick up and delivery. We offer door-to-door transport, as long as our driver can safely reach your residence. If not, our dispatchers will help you locate a nearby location to meet our driver. Our dispatchers will call 24 hours before pick up and delivery, and our driver will call 30 minutes before he arrives. Q: How much does it cost to ship my vehicle? A: We formulate the quote price by calculating current market value, location, carrier type, vehicle type, millage, fuel price, route conditions and window for pick up. We strive to offer you a competitive price that fits all budgets. Q: How long is my quote price good for? A: Your quote price is valid for 30 days from the time you receive the quote email when you request an online quote. Q: How do I pay for my shipment, and can I cancel if my plans change unexpectedly? A: You can pay with a credit card over the phone, or you can pay the driver upon delivery with a money order, cashiers check or cash. You owe nothing upfront. As soon as we have your order scheduled and a carrier lined up, we will process a deposit, which is included in the quote price, and the remaining balance will be due upon delivery. Should you need to cancel your order for any reason, we require a 48-hour advance notice. You will not be charged for the transport, and your deposit will be returned in full. If you cancel after the 48-hour window, you will not be charged for the transport, but the deposit is non-refundable. Q: Do I receive a discount for transporting multiple vehicles? A: In most cases, yes, you will receive a discount for shipping two or more vehicles. Q: Am I obligated to pay for my transport? A: As stated by Federal Law, yes, a trucking company must be paid for services rendered. If you withhold the carrier’s payment partially or in full, the driver can legally hold the vehicle, until all applicable fees are paid. A: Along with our seasonal “snowbird” clients, we’ve become a popular choice for helping active or retired military service men and women transport their vehicle. It’s always our goal to offer the best available rate for every customer, and we do offer a military discount. Call 888-514-4005 ext. 121 to learn more about our military relocation services. Q: Can I ship personal items? A: It goes without saying, this is the most common question we’re asked. 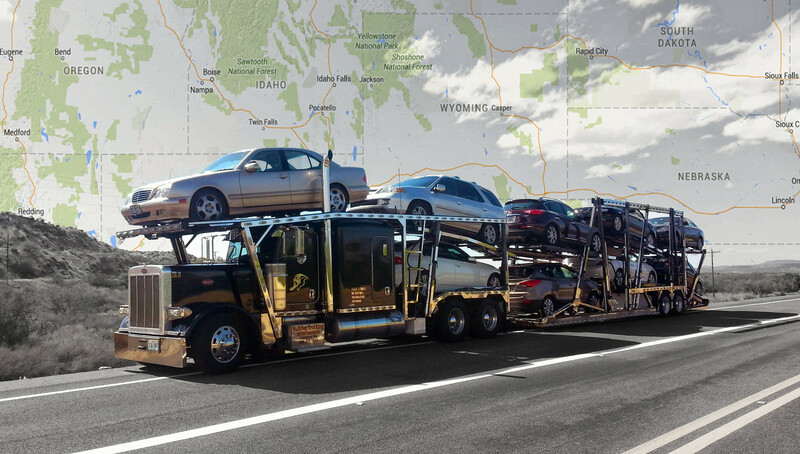 So you are aware, auto transport companies are not licensed to transport personal goods in a vehicle on a carrier across state lines by state and federal Department of Transportation. However, a suitcase or two packed in the trunk, or secured on the floorboard or cargo area that sits below the window line and is less than 100 pounds is not a problem. If you need to load more additional goods, we’ll need to know, as there is an additional charge of $150 for additional cargo exceeding 100 pounds. Transport carrier are legally allowed to haul up to 80,000 pounds. Any additional personal items can affect the weight on the trailer. Q: Is my vehicle insured during transport? A: Yes, your vehicle is covered by our liability cargo insurance from the point your vehicle is loaded to delivery. Our insurance covers at least $250,000, and we require all outside transport partners to carry at least $150,000. Any additional personal goods placed in the vehicle, however, are not covered by the carrier’s insurance. And the carrier is not responsible for any damage caused by loose personal goods inside the vehicle. We also offer contingent cargo insurance should an outside carrier’s policy fail to pay a valid claim. The contingent cargo insurance starts at $99, and we’ll handle the claim and take care of any valid damage caused by the carrier. If you wave the contingent cargo insurance, and your vehicle is damaged by an outside carrier, we’ll guide you through the claims process with the carrier, but we cannot guarantee the carrier will pay for the damage. Q: What do I do if my vehicle is damaged during transport? • File a claim: Submit pictures and two estimates to claims@bulldogautotransport.com within 24 hours after delivery. • If we do not receive pictures and two estimates within 21 days of delivery, a claim will be voided. *We’re required by law to provide carrier Certificate of Insurance upon request by the customer. We also recommend you contact your insurance company before your transport to make sure your policy covers auto transport. Certain Acts of God and things the carrier cannot control are covered by your insurance. You are not required to pay a deductible when filing a damage claim. Q: How long does it take to secure a carrier? A: We have three different shipping options to fit different needs and different budgets. Q: Do you guarantee pick up? A: We require a two-day window for pick up and delivery, in the event our driver faces a delay do to mechanical, road conditions or weather. However, if your schedule is tighter than two days, we can offer guaranteed pick up for your vehicle for an additional $99 fee. Q: How long does it take to transport my vehicle? Q: How do I prepare my vehicle for shipment? A: It’s important to make sure your vehicle is clean so than any existing damage, scratches, marks or scuffs are fully visible. We are not responsible for any additional damage caused to any part with pre-existing damage, or damage that was undetectable at the time of pick up because the vehicle was dirty. We do recommend removing any personal items, especially anything of value. The carrier is not responsible for any personal items, or damage caused by any loose items placed in the vehicle. Any external modification, including roof racks or spoilers, that can fly or fall off during transport should be removed and stored safely inside the vehicle. It’s a good idea to cover or wrap your driver’s seat and floormat in the event the driver gets any dirt in the vehicle during loading or unloading. We also recommend leaving 1/4-tank of fuel in your vehicle to help with balance and weight, but it’s not mandatory. In other words, don’t feel compelled to drive your car around to use excess fuel. Q: Do I need to drop off my vehicle, and do I need to be present for pick up and delivery? A: In most instances, unless another arrangement is made, you won’t have to drop off or pick up your vehicle from a terminal. Our custom domestic quote price reflects door-to-door transport service. We do recommend you or a representative you appoint be present for both pick up and delivery. If nobody can be present for pick up or delivery, we can arrange for terminal service or for local transport to a terminal with our $99 guaranteed pickup service. Q: Do you offer terminal service? A: If you’re unable to be present for pick up or delivery and do not want to pay for guaranteed pickup service, we can arrange for your vehicle to be stored at a terminal, either for pick up, for delivery or both. It’s important to note the customer is responsible for dropping off and picking up closest to the pick up and delivery locations. If you need terminal service, we can set up the service for you and include it in the quote price.